With all the support he is getting, as people rally behind him, Francisco "Paco" Larrañaga, who was accused in the Chiong sisters murder case expressed his words of gratitude. 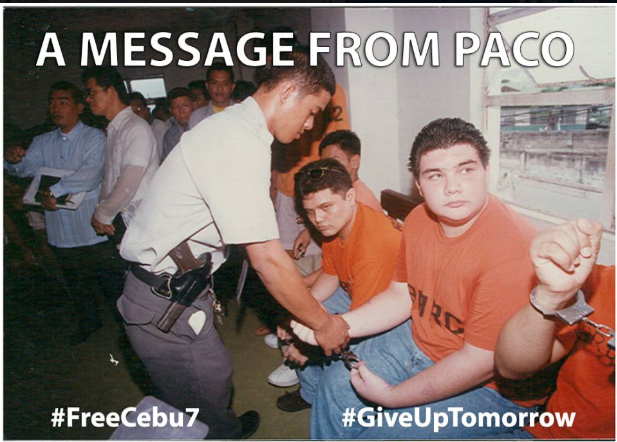 The Facebook page Give Up Tomorrow (the documentary film of the infamous case) has posted Paco’s message for everyone who supports him. "I wanted to say thank you from the bottom of my heart to all of you who have sent me messages of support, encouragement and prayers. Thank you for taking the time to learn about the human rights abuses and the facts of our case. This is very important to me because maybe by knowing what happened to us it will prevent more innocent people from falling through the cracks of the justice system. Thank you for being my voice when I cannot speak out in our fight for justice. I am so overwhelmed with gratitude. Reading your messages puts a smile in my heart." Paco wrote. “I also wanted to tell you that I am not the only one who is innocent. My 6 co-accused are just as innocent as I am. “ Paco said. “I am fortunate that Spain’s prison system is humane and rehabilitative and that they have allowed me to complete culinary school and to work, but not a day goes by that I do not think about James Andrew, James Anthony, Alberto, Ariel, Josman and Rowen and feel a pain in my soul because they do not deserve to be in Bilibid any more than I do." he added. He even pleaded to his supporters to also hear the stories of his 6 co-accused. Hello Everybody! This is Paco. I wanted to say thank you from the bottom of my heart to all of you who have sent me messages of support, encouragement and prayers. Thank you for taking the time to learn about the human rights abuses and the facts of our case. This is very important to me because maybe by knowing what happened to us it will prevent more innocent people from falling through the cracks of the justice system. Thank you for being my voice when I cannot speak out in our fight for justice. I am so overwhelmed with gratitude. Reading your messages puts a smile in my heart. I also wanted to tell you that I am not the only one who is innocent. My 6 co-accused are just as innocent as I am. I am fortunate that Spain’s prison system is humane and rehabilitative and that they have allowed me to complete culinary school and to work, but not a day goes by that I do not think about James Andrew, James Anthony, Alberto, Ariel, Josman and Rowen and feel a pain in my soul because they do not deserve to be in Bilibid any more than I do. They are victims of injustice just like me. If you can, please hear their stories too.